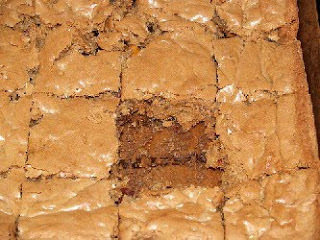 After talking about butterscotch brownies yesterday, a lot of you seemed to want the recipe to them. Here it is, Enjoy! Preheat oven to 350F. Grease a 9 inch baking pan. Melt the butterscotch chips in a small saucepan over low heat, constantly stirring it. Set aside. Beat the brown sugar and butter in a large bowl until light and puffy. Beat in the eggs one at a time. Beat in melted butterscotch chips and vanilla. Combine flour, baking power and salt in small bowl, add to butter mixture. Beat until well blended. Spread batter evenly in prepared pan. Bake 20-25 minutes or until golden brown and center is set. Place pan on wire rack. Cool completely before eating. Cut into 2 inch squares. I've noticed it's better to cut them while still hot. It makes it much easier. ooo, those do sound delicious! :) but I wont be making them because I'm positive they would make me, my family and everyone in my neighborhood fat! ;) thanks for sharing. I'm drooling ... These look delicious! Yum! Those look soooo good! I'm going to have to try them! Pure yummy! When I can eat again I will have to eat these! *sigh* Yum. These look amazing! Umm...so good! Thanks for the recipe! note to self. Go buy butterscotch chips. Oh these look beyond amazing!!! Thanks for sharing! yummmm! i need to find butterscotch chips in amsterdam so i can make these! Those sound so yummy! I love anything butterscotch...cookies, candy, pudding... This one is going in the recipe book. Those seriously look and sound delicious! Thanks for the recipe! You are not making my Lenten resolution of no carbs ANY easier!!!!! :) Delicious! I would LOVE for you to do the same thing I posted on my blog today. I am loving reading the ones that other people have posted today! Oh my gosh those look delicious. I can't make them though. I would literally eat the entire pan in one sitting! Y-U-M!!! I will soooo be making these!!! I can't seem to stop eating sugar so I just might have to cave and bake these. OMG that recipe sounds incredible, at least it looks tasty. Miss Cleo or Divine Intervention?